HM Revenue and Customs. 2014. Excise Notice 75: fuel for road vehicles. [ONLINE] Available at:https://www.gov.uk/government/publications/excise-notice-75-fuel-for-road-vehicles/excise-notice-75-fuel-for-road-vehicles. [Accessed 03 May 15]. Crown Oil UK. 2015. Red Diesel – Red Diesel Delivery. [ONLINE] Available at:http://www.crownoiluk.com/products/red-diesel-suppliers/. [Accessed 03 May 15]. The AA. 2011. Dirty diesel. [ONLINE] Available at: http://www.theaa.ie/AA/Ezine/AA-Ezine-September-2011/Dirty-diesel.aspx. [Accessed 03 May 15]. The AA. 2010. AA WARNS OF LAUNDERED AND SUB-STANDARD DIESEL. [ONLINE] Available at: http://www.theaa.ie/blog/aa-warns-of-laundered-and-sub-standard-diesel/. [Accessed 03 May 15]. The Irish Times. 2013. Two mobile diesel laundries discovered in Co Louth. [ONLINE] Available at: http://www.irishtimes.com/news/crime-and-law/two-mobile-diesel-laundries-discovered-in-co-louth-1.1357146. [Accessed 03 May 15]. The Independent Newspaper. 2015. High number of diesel laundries. [ONLINE] Available at: http://www.independent.ie/regionals/argus/news/high-number-of-diesel-laundries-30980718.html. [Accessed 03 May 15]. Irish Petroleum Industry Association. 2014. Contaminated Motor Fuel. [ONLINE] Available at: http://www.ipia.ie/wp-content/files_mf/contaminatedmotorfuel.pdf. [Accessed 03 May 15]. The Independent Newspaper. 2012. Laundered fuel can destroy your engine. [ONLINE] Available at: http://www.independent.ie/regionals/argus/news/laundered-fuel-can-destroy-your-engine-26963643.html. [Accessed 03 May 15]. Revenue Irish Tax and Customs. 2014. Excise Duty Rates. [ONLINE] Available at: http://www.revenue.ie/en/tax/excise/duties/excise-duty-rates.html. [Accessed 03 May 15]. … especially stone-encrusted flip-flops. And pink toenails. .. because no one wants to drop their smart phone in a puddle. Or a Portaloo, for that matter. … still being up for kissing someone when they’re covered in crusty mud. In 2005, the flooding at Glastonbury was so bad that many people lost their tents and belongings and rescue teams had to wade in to help. This brave reveller tries to swim through a murky sea of roll-mats, Pot Noodles and cider, all the while keeping his camera aloft. 6. 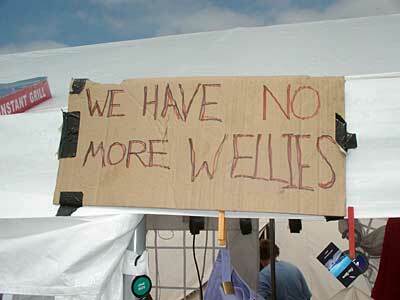 What’s worse than a muddy Glastonbury? Another shot from 2005 – look at the dome tents poking out of the top of the water! When you’re not content with taking a ride in our handy, festival kayak, give some kids a lift too. If you’re going to spend the weekend covered in mud, you might as well wrestle in the stuff. Probably a good idea to remove the shirt and tie first, though. From council-owned wheely bins to shopping trolleys, festival attendees will use anything they can to drag their camping gear through the churned-up mud. Believe it or not, this isn’t an image from a military training exercise, but it does depict people (apparently) enjoiyng themselves at Glastonbury 2011. 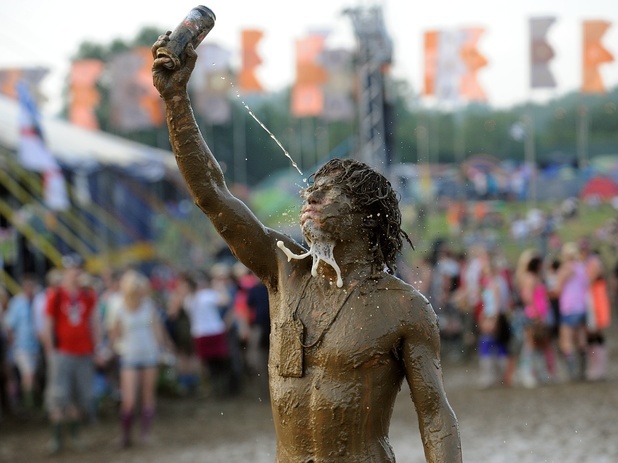 Warm lager and mud – the perfect coupling of every good festival. 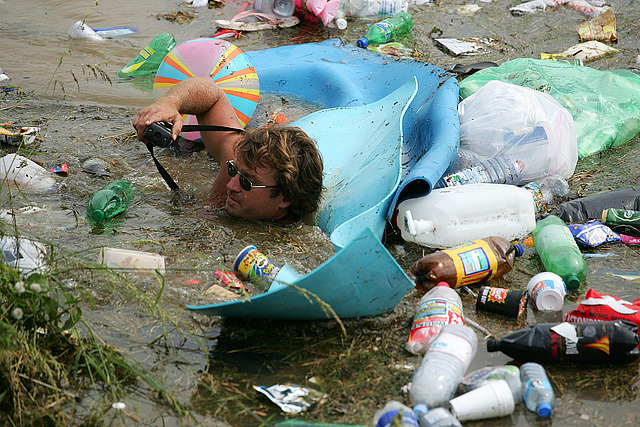 Every Glastonbury season, the British press to to make people feel better about the fact they weren’t lucky enough to get a ticket to the festival by showing them photographs of people in soggy, sorry states. This doesn’t work when the ticket holders look as carefreee as this guy, snapped in 2011. Spare a thought for the people who have to try to make the farm as close to clean as they possibly can. 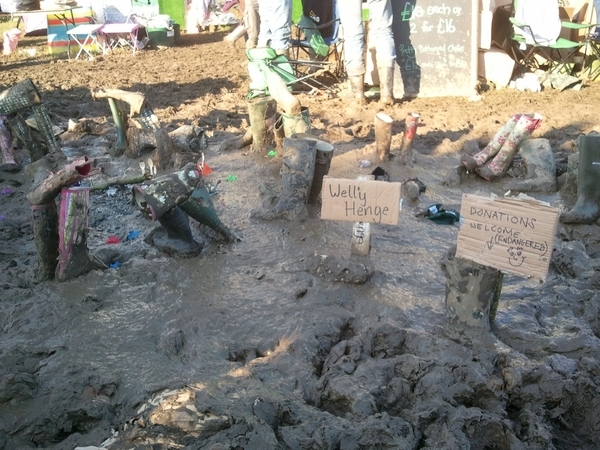 … and don’t bother with cheap wellies, as they’ll probably end up here, the site of next year’s summer solstice festival.